TS Teachers Transfers Schedule 2018 Latest news TS Telangana Teachers District wise Seniority List, Vacancies List for Transfers, Promotions 2018 District Wise Seniority List, SGT SA LP PET GHM Vacancy List Transfer Orders download Telangana/TS Teachers District wise, Subject wise and Post wise Seniority List,Vacancies List for Transfers, Promotions, Rationalisation: Transfers Vacancy and Seniority List of Adilabad, Khammam Hyderabad , Nalgonda, Karimnagar , Warangal, Medak, Ranga Reddy, Mahaboobnagar , Nizamabad old 10 Districts of Telangana Category wise of GHM SAs LPs SGT PET as per their entitlement points will be displayed in DEO Websites of all District Educational Officers official web Portals and cdse.telangana.gov.in after recieving Online Application Forms at cdse.telangana.gov.in and calculating entitlement points as per the exercising Online Application forms from the teachers. District wise Post wise clear vacancies list will be placed in concern District Educational Officers Website Telangana State District wise Seniority List, Clear Vacancies List, Long Standing 5/8 years HM's and Teachers list. Subject wise, Post wise Seniority List, Clear Vacancies List, Long Standing 5/8 years Teachers list. deo adilabad, deo hyderabad, deo karimnagar, deo khammam, deo medak, deo nizamabad, deo rangareddy, deo warangal teachers transfers, promotions and rationalisation information. District wise teachers transfers, promotions, rationalisation information. Telangana Govt agreed to conduct General Transfers to Teachers in 2018. An IAS Committee also constituted to frame guidelines for smooth conduct of teacher Transfers in Telangana. Committee will issue instructions and Guidelines regarding transfers . 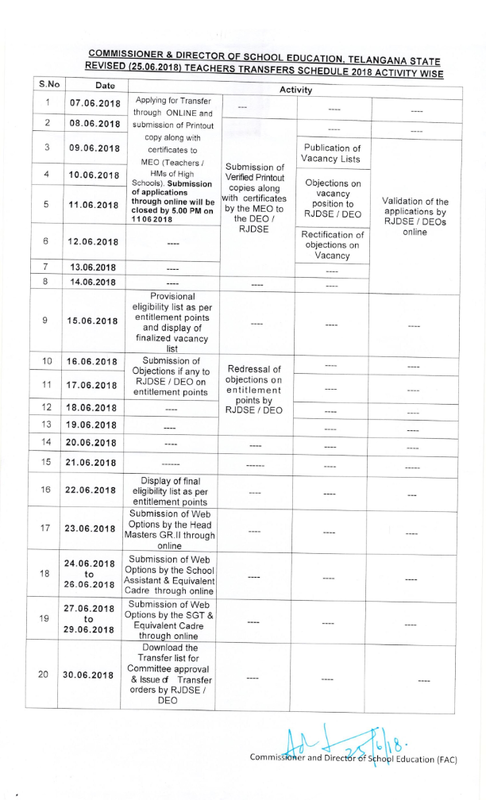 commissner and Directorate of School Education Department of Telangana give day wise Schedule for Submission of Online Application Form at www.cdse.telangana.gov.in. After the scruitiny of Submitted Online Application Forms, Seniority list will be prepared as per the entitlement points they get. District wise SGT School Assistants Telugu Hindi English Maths Physical Science Bio Science Social Studies Language Pandits Telugu Hindi Urdu Physical Education Teachers GHMs Seniority and Vacancy Lists will be posted in the DEO Websites. Here are the District wise DEO Official Web Portals. # TS Teachers Transfers 2018 Final Seniority Lists . 1. Web counselling for teachers transfer, the counselling should be conducted only Online method. 2. In this counselling Head Master Gr.II (Gazetted), who have completed (5) years of service in a particular School as on 1st June 2018 , Teachers, who have completed (8) years service in a particular school as on 1st July 2018 year shall be compulsorily transferred, provided those who are going to retire within two years from 1st June of the current year shall not be shifted until and unless the incumbent requests for such transfer. 5. Transfers for GHMs would be complete by June 2018 and goes on. 7. Previous DSC selected candidates may be appointed. 8. Promotions to HM and SA posts only in all dists. Telangana TS Teachers Transfers, Promotions Counselling Schedule 2018:elangana/TS Teachers District wise, Subject wise and Post wise Seniority List,Vacancies List for Transfers, Promotions, Rationalisation: Telangana State District wise Seniority List, Clear Vacancies List, Long Standing 5 years HM's and 8 yearTeachers list. Subject wise, Post wise Seniority List, Clear Vacancies List, Long Standing 5 year 8 years Teachers list. deo adilabad, deo hyderabad, deo karimnagar, deo khammam, deo medak, deo nizamabad, deo rangareddy, deo warangal teachers transfers, promotions and rationalisation information. District wise teachers transfers, promotions, rationalisation information ..So, Eligible teachers can apply through online and take printout. Signed print copy along with required documents should submit to the Concerned your respective officials. Transfers Vacancy and Seniority List of Adilabad Khammam Hyderabad Nalgonda Karimnagar Warangal Medak Ranga Reddy Mahaboobnagar Nizamabad old Districts of Telangana Category wise of GHM SAs LPs SGT PET as per their entitlement points will be displayed in DEO Websites and cdse.telangana.gov.in .